See why Carol absolutely LOVES her new hearing aids. Carol* recently came to Ascent Audiology & Hearing for a hearing evaluation. After a hearing loss was diagnosed, hearing aids were discussed. It quickly became very clear that Carol loves one thing: technology! She is very tech-savvy and on her phone almost all the time making phone calls, watching videos, and listening to music and audiobooks. ​Binaural Streaming − Stream sound to both ears for phone calls, music, videos, Siri, and audio. Remote Control − Change the volume and programs easily right in the app. “SoundSpace” − A program that allows you to adjust and save the sound settings for different locations, so whenever you return to a saved location your hearing aids will automatically switch to the saved setting for that location. For example, if you visit a restaurant often and set a specific sound profile there, every time you return to that restaurant the GPS function will recognize the location and the SoundSpace program automatically places the saved sound settings in the hearing aids. You can create up to 20 saved locations. Microphone − Use your iPhone as a microphone. For example, if you are in a lecture hall or place of worship, by setting your phone near the speaker, it will wirelessly send that voice directly to your hearing aids. 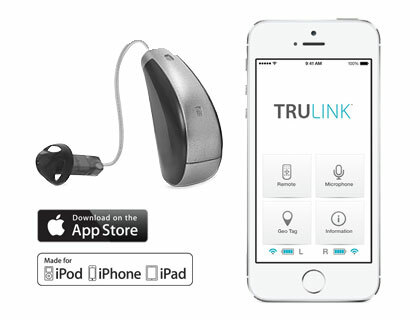 GPS Tracker − To find lost hearing aids. After a few weeks using the Halo 2 hearing aids, Carol was ecstatic. She was so pleased that she could now hear so much better than before, and use her iPhone to stream sound directly to her hearing aids. And being a self-professed tech lover, she also loves playing around with the apps and programs that provide so much flexibility right at her fingertips.